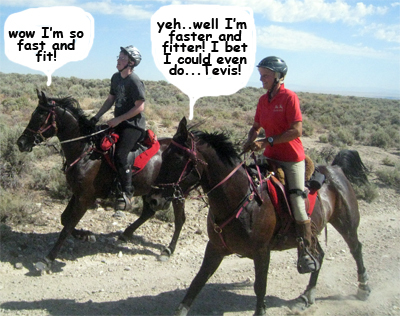 Steph's Endurance: Tevis- packed and ready to go! It's been a while since I've had to pack and plan for a big ride, and since I'm not taking my truck/trailer (THANKYOU NANCE AND BRUCE!) I'm really having to pack with purpose. Don't want to take too much (that one is already a joke) but don't want to forget anything (I hauled my stuff over to Carol's tonight since she's taking us to meet Nance and Bruce along the freeway and she asked where was my saddle....? oops). This trip/adventure really fell into place, and it's been open doors since the idea popped into my head. Last week our oldest son Clay and his wife Wynne and 2 1/2 yr old grandson (!!) Cameron, spent several days with us. It was a lovey visit, Cam loves to be on a horse with his Dad, and wonder of wonders Clay said he thinks he might want to do endurance! (omg). He did lots of riding when he was younger, jumping and all that stuff, and joined me on my first ever endurance ride back in 1991 (we switched horses half way through because his appy was lame and I let him finish on my arabian - duh, no completion but fun still). But I was totally shocked when he wanted to go out for a ride. First ride was pokey, and he survived. Second ride I put him on Batman (superhero fast) and I rode Rhett, and John rode Sunny (aka Robin) and we had a fast and fun 10 mile romp around the desert. The horses were amazing, and so was Clay! He still knows how to ride after all these years, and had fun! I still had no inkling that I'd decide in the next few days to head for Tevis... but I think Rhett knew. He was amazing.